Yesterday, I finished something I wanted to do ever since I bought my car. 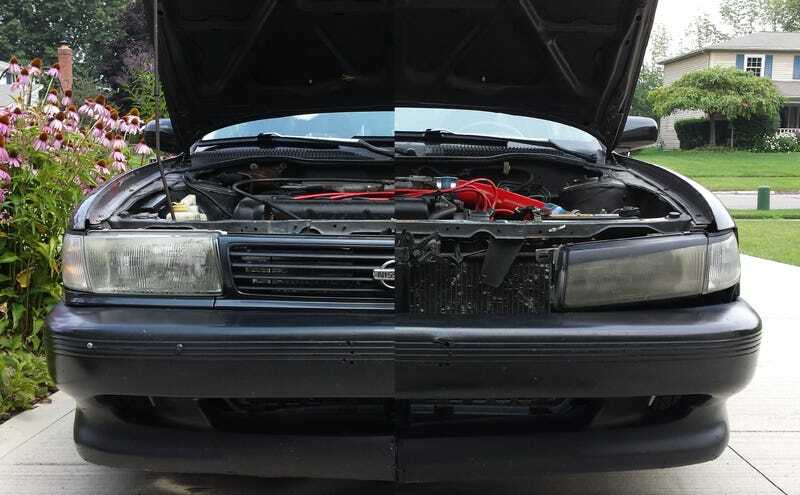 As you can see in the right half of the picture, the previous owner of my car thought it would look cool to paint the top of the headlights, remove the grill and trim piece that goes underneath it, and thoroughly mess up the hood latch and the support that screws on to it, just for good measure. Also, the headlights were only held in with one bolt and a zip tie each. Except the zip ties were broken. Now there's nothing wrong with this, but it wasn't really my style, and I wanted it to look stock. My journey started in the wonderland that is Pull-a-Part. There are 3 or 4 within a reasonable distance of me, but only one (In East Cleveland; not the nicest place in the world) had a b13 Sentra. It was arguably in better shape than my car, so my friend and I set to work on changing that. Unfortunately it was the base model, so I couldn't get and engine parts, but I did get new headlights, turn signals, a grill (with Nissan badge! ), and quite a few other small parts for only $115. Considering individual B13 headlights are going for $200 new these days, I'm pretty content with my purchase. I got everything installed fairly easily with a little help from my dad. The plug for the driver's headlight was melted, so he helped me wire up a new one, and it works just like new. Another modification made by the previous owner was an Apexi N1 muffler; also known as a fart can. I took it up to a muffler shop last week, however, and got a new Dynomax muffler installed. The difference between the two is pretty dramatic. The Dynomax is still louder than stock, but it makes quite a nice twin-cam noise, just how an old, rev-happy four cylinder should. I'm not fond of the exhaust tip; I want to fabricate a new one sometime soon, but just about anything is better than the old one. So that's a quick update on where I'm at with my car now. I've gotten a few other things like new wipers and a new catalytic converter. The next thing on my list is to clean up the engine bay and get it running a little better. I'm probably going to get a shorter intake as well, because currently the air filter is wedged against the battery.